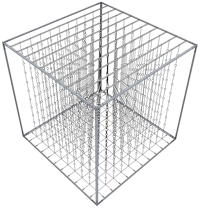 Second of all, I had a question regarding the measurements of the visual cube. I am working on building an 8X8X8 RGB LED 3D Cube.I’m still in the studying phase of all the areas of the project, and when I came across deciding the internal distance between each RGB LED and the size of the RGB LED , I got confused ? I did not know how or what theory to follow in order to choose the correct measurements . Hi. The LED distance mainly depends on the later viewing position. For our case the cube was designed to be installed in a large distance to the viewer (mounted to the ceiling of a large hall). The larger this distance grows, the larger the distance between the LED Voxel balls can be. Be aware that too small distances between the Voxels may destroy the 3D effect. In such a case you should consider to shrink the radius of the Voxel balls. It’s not easy to find the best tradeoff. Good luck with you project!